One of my oldest friends, jazz guitarist Paul Bollenback, has released his latest CD, “Brightness of Being” , with yet another all star line-up. Saxophonists David “Fathead” Newman, Gary Thomas and Tim Garland, vocalist Chris McNulty, drummers Teri-Lynne Carrington and Ari Honnig, and bassist James Genus. “Being” is Bollenback’s sixth album, and like a fine wine, he keeps getting better. “Luap”, as I’ve affectionally come to know him, has out done himself once again wth this very fine effort. “Not one jazz virtuoso could put the definition of jazz into words, but all agreed that you know it when you hear it. That’s the way it is with Paul Bollenback. It’s bona-fide playing, unambiguous, up-front and powerful,” summarized guitar master George Benson, a long-time supporter. Bollenback’s debut recording as a leader, “Original Visions”, on Challenge Records, is one of the most creative efforts by a guitarist in recent memory. “Double Gemini”, his second CD, features four of his own compositions and won the title of CD of The Month in Jim Fisch’s distinguished jazz column in 20th Century Guitar Magazine. It won the same award from the renowned jazz radio station WBGO in Newark, New Jersey. His 3rd release on Challenge, “Soul Grooves”, won ‘Ndigo Magazines “Best Contemporary Jazz Album of 1999”. Challenge has since released “Dreams” and “Double-Vision”, and now Bollenback has released his 6th project as a leader, “Brightness of Being”, on the Elefant Dreams label, in February 2006. 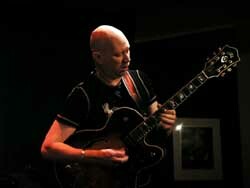 Bollenback’s emotionally expressive style and eclectic approach is the result of a wide range of influences, including Carlos Santana, Yes, Wes Montgomery, George Benson, Kenny Burrell, Herbie Hancock, Bill Evans, John Coltrane, Wayne Shorter, John McLaughlin, Jimi Hendrix, Johnny Winter and Lenny Breau. At the age of seven, he received a nylon-string guitar from his father, a scientist, classically trained trumpeter and lover of music. When Bollenback was eleven, his family relocated from Hastings on Hudson, New York, to New Delhi, India. It was there that he cultivated his life-long interest in exotic musical sounds and timbres, which is evident in even his most jazz-based work. When his family returned to New York, Paul’s father bought him an electric guitar and he started to gig in rock and roll bands around the area. Then he heard Miles Davis and his world changed forever. In 1991 his two compositions, “Wookies’s Revenge” and “Romancin’ the Moon” (featured on Joey DeFrancesco’s Reboppin’) earned him the SESAC award for original music. In 1993 while touring in Europe, Paul was awarded a grant from the Virginia Commission on the Arts and the National Endowment for the Arts to compose and perform “New Music for Three Jazz Guitars”. In 1997, Bollenback was named Musician of the Year at the Washington Area Music Awards. In his review of “Being”, All About Jazz editor John Kelman wrote, “While unequivocally mainstream, Brightness of Being is no retro relic. There’s nary a standard to be found, although Bollenback places some contemporary songs into straightahead but fluidly open contexts. Saxophonist David “Fathead” Newman appears on two tributes to the late Ray Charles: “Unchain My Heart,” which has a ‘60s Blue Note soul-jazz vibe; and “You Don’t Know Me,” which Bollenback relocates from country juke joint to late night smoky bar.